This is an experiment to see if a group of serious students of value investing can learn from each other and an in-depth reading of the course materials to become better investors. If you send me your email to aldridge56@aol.com (DEEP VALUE COURSE) in the title, I will send you the course materials (Thanks to a reader for contributing!). There is a catch however. You are expected to do the readings and comment/participate in the discussion in the comments section. So don’t seek unless committed to being an active participant. Since there will be supplementary readings for each chapter of the book (see chapter titles below), we will take one to two weeks per chapter. You may have homework or be asked to research investment questions further. I won’t think any less of you if you decide to pass–this course is only for fanatics. Course will start a week or two into the New Year. Description of the book below (also type in DEEP VALUE) in the search box of this box and view some of the videos on deep value and the author, Toby Carlisle. Also, go to www.greenbackd.com and look at the past ten posts. 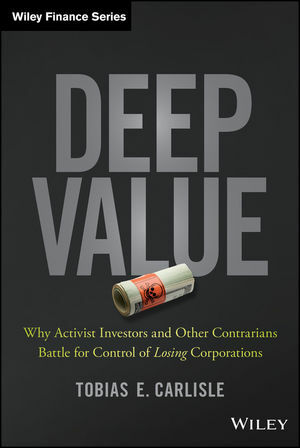 Deep Value: Why Activist Investors and Other Contrarians Battle for Control of Losing Corporations is a must-read exploration of deep value investment strategy, describing the evolution of the theories of valuation and shareholder activism from Graham to Icahn and beyond. The book combines engaging anecdotes with industry research to illustrate the principles and methods of this complex strategy, and explains the reasoning behind seemingly incomprehensible activist maneuvers. Written by an active value investor, Deep Value provides an insider’s perspective on shareholder activist strategies in a format accessible to both professional investors and laypeople. Whitman Critiques Prof. Greenwald’s Value Investing Book. A reader, the Great Sandesh, alerted me to this. By the way, I am not a fan of Prof. Greenwald’s book, Value Investing — From Graham to Buffett and Beyond written by Bruce C.N. Greenwald, Judd Kahn, Paul D. Sonkin and Michael van Biema. But I do highly recommend his book, Competition Demystified, to learn strategic analysis. There seems to be a general misunderstanding about wealth creation companies in the financial community and in academic circles. First, there is scant recognition of the fact that outside of Wall Street, where one deals with privately owned businesses, the vast majority of economic endeavor involves striving to create wealth in the most tax effective manner. Where control persons have choices, they would rather create wealth by some means other than having ordinary income from operations simply because striving for cash flows or earnings from operations tends to be highly inefficient tax-wise. Second, in their new book, Value Investing — From Graham to Buffett and Beyond written by Bruce C.N. Greenwald, Judd Kahn, Paul D. Sonkin and Michael van Biema (Greenwald and van Biema are faculty members at Columbia Business School), the authors seem to have trouble identifying, and valuing, net assets. They state, “in the contemporary investment world net-nets are, only with the rarest exceptions, a distant memory.” In fact, though, each of the nine wealth-creation common stocks Third Avenue acquired during the quarter is a net-net by any economic, non-accounting convention, definition of net-nets. Greenwald, et al define net-nets only by looking at accounting convention, not economic reality. They define net-nets as a common stock available at a price that represents a discount from a company’s current assets after deducting all book liabilities, both short-term and long-term. The problem with this measurement is that for going concerns, much of their current assets are not current assets at all, but rather fixed assets of the most dubious value. For example, Sears Roebuck, like any other retailer, could not stay in business if it did not maintain inventories continually, which in Sears’ case have a carrying value of over $5 billion. In the aggregate, these inventories are a fixed asset for the going concern, not a current asset. Individual inventory items do turn to cash within 12 months and thus are, for accounting purposes, called current assets. In fact, though, Sears’ aggregate $5 billion investment in inventory is a permanent investment, particularly vulnerable to seasonal mark-downs, theft, obsolescence and mislocations. Contrast this with Forest City’s developed real estate projects. While Forest City’s developed real estate is called a fixed asset, a substantial portion of these assets is really quite current, a source of almost immediate cash through sale or refinancing, without interfering with Forest City as a going-concern. Forest City Common is a true net-net. The same is true for other wealth creation common stocks acquired during the quarter at substantial discounts from readily ascertainable net asset values; — including the probable real estate values in Alexander & Baldwin and Catellus; the probable securities values in Brascan (including real estate), Phoenix Companies, MONY and Toyota Industries; and the probable values of Assets Under Management (AUM) for BKF and Legg Mason. — Warren Buffett; Mario Gabelli; Glen Greenberg; Robert H. Heilbrum; Seth Klarman; Michael Price; Walter and Edwin Schloss and Paul D. Sonkin. It’s a worthwhile read. Third Avenue, in its practices, seems to have much in common with these investors. The front of the Greenwald book, though, describes underlying theories about value investing. These theories seem to have nothing to do with the basic assumptions under which Third Avenue operates. Contrasting the Third Avenue approach with the Greenwald approach ought to be helpful in getting investors to understand the Third Avenue modus operandi. A major difference between the Greenwald approach and the Third Avenue approach revolves around valuing a company and valuing a security. Greenwald, et al state, “There is general agreement that the value of a company is the sum of the cash flows it will produce for investors over the life of the company, discounted back to the present.” The Greenwald approach is far too general to be useful for Third Avenue. For TAVF, there exist four factors which contribute to corporate value and three factors which determine the theoretical value of a security. 1. Free cash flow from operations available for the security holder: Very few companies ever actually achieve such free cash flows on a reasonably regular basis. While for any individual project to make sense it has to return a cash positive net profit over its life, this is not true for most companies (as distinct from stand-alone projects), especially expanding companies. Most businesses consume cash. TAVF likes to invest in the common stocks of those few companies in a position to create cash flows on a regular basis. The principal area where this takes place in the Fund’s portfolio is in money management companies: — BKF, John Nuveen, Liberty Financial and Legg Mason. 2. Earnings: Most prosperous going concerns create earnings, not free cash flows. Earnings exist where a company creates intrinsic wealth from operations while consuming cash. Since most going concerns consume cash, their earnings streams may be of limited value unless such flows are also combined with access to capital markets, either credit markets or equity markets or both. TAVF, in acquiring the common stocks of earnings companies, limits its acquisitions to businesses with exceptionally strong financial positions. This means, most of time, that the companies have far less need to have access to capital markets during any given period than run-of-the mill, less well capitalized, going concerns. More importantly, though, the companies whose issues the Fund acquires have rather complete control over the timing as to when they want to access debt markets or equity markets. Capital markets are notoriously capricious in terms of both pricing and availability. TAVF tries to avoid investing in the common stocks of less well capitalized companies, in part because such issuers frequently are forced to raise outside capital at the most disadvantageous times. Well-capitalized earnings companies whose common stocks were acquired by TAVF during the quarter include Energizer, Trammell Crow, American Power, Applied Materials, AVX, Credence, Electro Scientific, KEMET, MBIA, Nabors, and Vishay. Most Wall Streeters and most academics, including Greenwald, et al, subscribe to a primacy of the income account point of view and believe that the dominant, and sometimes even the sole, sources of corporate value are flows from operations: — both cash flows and earnings flows. At TAVF, we have a balanced approach. Indeed, we think more corporate wealth is created in the U.S. by the two factors discussed below than by flows, even though frequently there tends to be a close, symbiotic relationship between flows, whether cash or earnings, on the one hand; and asset values and access to capital markets on the other. 3. Resource conversion activities encompass repositioning assets to higher uses, other ownership or control, or all three; the financing of asset acquisitions, the refinancing of liabilities or both; and the creation of tax advantages. These activities take the form of mergers and acquisitions, contests for control, leveraged buyouts, restructuring troubled companies, spin-offs, liquidations, massive securities repurchases, and acquiring securities in bulk through cash tender offers or exchange offers. Within the Third Avenue portfolio, it appears as if some 3% to 5% of the common stocks held are subject to takeover bids of some sort by control investors every quarter. Common stock issues acquired during the quarter which may very well be involved in getting taken over in the years ahead include Energizer, Phoenix, Alexander & Baldwin, BKF, Catellus and MONY, albeit Fund management has never been really good at identifying which companies will be “in play” at any given time in the future. 4. Access to capital markets at super-attractive prices: There seems little question that far more corporate wealth has been created in this country by taking advantage of attractive access to outside capital than by any other single source. The Greenwald book, and indeed virtually all economic literature, ignores this factor as a source of wealth, or a source of franchise. Unfortunately, as a passive value investor, the Fund does not often get to benefit from super-crazy prices that exist in equity markets from time to time. To benefit from these super-crazy prices as a price conscious value investor, TAVF would have to become a venture capital investor seeking IPO bailouts; something that seems to be outside Fund management’s sphere of competence. Fortunately though, many of the companies in whose common stocks Third Avenue has invested have super attractive access to credit markets where they are able to obtain low interest, long-term, non-recourse financing for major portions of the projects which they build, or in which they invest. Companies whose common stocks the Fund invested in during the quarter, with such attractive access to capital markets, include Alexander & Baldwin, Brascan, Catellus and Forest City. The language used by all academics, including Greenwald, et al, that securities values are a function of the present worth of “cash flows” is unfortunate. From the point of view of any security holder, that holder is seeking a “cash bailout”, not a “cash flow”. One really cannot understand securities’ values unless one is also aware of the three sources of cash bailouts. A security (with the minor exception of hybrids such as convertibles) has to represent either a promise by the issuer to pay a holder cash, sooner or later; or ownership. A legally enforceable promise to pay is a credit instrument. Ownership is mostly represented by common stock. There are three sources from which a security holder can get a cash bailout. The first mostly involves holding performing loans; the second and third mostly involve owners as well as holders of distressed credits. 1. Payments by the company in the form of interest or dividends, repayment of principal (or share repurchases), or payment of a premium. Insofar as TAVF seeks income exclusively, it restricts its investments to corporate AAA’s, or U.S. Treasuries and other U.S. government guaranteed debt issues. 2. Sale to a market. There are myriad markets, not just the New York Stock Exchange or NASDAQ. There are takeover markets, Merger and Acquisition (“M&A”) markets, Leveraged Buyout (“LBO”) markets and reorganization of distressed companies markets. Historically, most of TAVF’s exits from investments have been to these other markets, especially LBO, takeover and M&A markets. 3. Control. TAVF is an outside passive minority investor that does not seek control of companies, even though we try to be highly influential in the reorganization process when dealing with the credit instruments of troubled companies. It is likely that a majority of funds involved in value investing are in the hands of control investors such as Warren Buffett at Berkshire Hathaway, the various LBO firms and many venture capitalists. Unlike TAVF, many control investors do not need a market-out because they obtain cash bailouts, at least in part, from home office charges, tax treaties, salaries, fees and perks. I am continually amazed by how little appreciation there is by government authorities in both the U.S. and Japan that non-control ownership of securities which do not pay cash dividends is of little or no value to an owner unless that owner obtains opportunities to sell to a market. Indeed, I have been convinced for many years now that Japan will be unable to solve the problem of bad loans held by banks unless a substantial portion of these loans are converted to ownership, and the banks are given opportunities for cash bailouts by sales of these ownership positions to a market. Greenwald, et al have a monolithic approach to analysis using three tools to analyze all companies — replacement cost of assets, earnings power, and franchise value. TAVF, on the other hand, analyzes different businesses differently, ranging from analyzing strict going concerns by giving heavy weight to earnings power, as for example AVX or Nabors; to analyzing businesses which are really investment companies masquerading as something else. Here, heavy weight is assigned to readily measurable asset values as well as an appraisal of managements’ abilities to increase these net asset values over the long-term. Catellus, Forest City, Hutchison Whampoa, Investor AB, and Toyota Industries are examples of such situations. Greenwald, et al, like almost all academics, consciously or unconsciously, look at companies as substantively consolidated with shareholders. This tends to be a non-productive approach almost all the time. At the Fund, companies are analyzed as stand-alones or parent-subsidiary. The common stock for TAVF is a different constituency from the company, or its management — separate and apart. Most academics pay much attention to an artificial calculation: — the Weighted Average Cost of Capital (“WACC”). WACC measures the cost of outside capital to a company as a blend of after-tax interest rates and capitalization values for common stocks based on references to current common stock prices in public markets. Interest is, of course, a cash cost, while capitalization rates for publicly traded common stocks have nothing to do with most companies since they do the bulk of their equity financing by retaining earnings rather than by selling new issues of common stock to the public. More importantly, though, WACC is not very meaningful for companies who have rather complete control of the timing as to when, or if, to access capital markets. Such companies will access outside sources of capital at the time WACC type pricing is most attractive to them. These are the companies in whose common stocks TAVF invests. A contemporaneous calculation of WACC for these companies tends to be not meaningful. Greenwald, et al discuss risk in general but do admit that relative price volatility in the securities market may not be an adequate measure of risk. For TAVF, the word risk cannot be used without putting an adjective in front of it. There is no general risk. There is market risk, investment risk, currency risk, terrorism risk, inflation risk, failure to match maturities risk, commodity risk, etc. The Fund tries to avoid investment risk; i.e., that the companies in whose securities we have invested will suffer permanent impairments. The Fund ignores market risk; i.e. that the trading prices of the securities held will fluctuate. Greenwald, et al assume, quite properly, that an overpriced common stock will attract new competition. Greenwald, et al, however, ignore something that may be much more important. An overpriced common stock, in the hands of a reasonably competent management, is frequently a most important corporate asset. Much of the small-cap high-tech investments of the Fund are in companies which were able to build up huge cash positions by taking advantage of the crazy prices that existed in IPO markets in the late 1990’s. I suggest readers heed Mr. Whitman’s comments since he is a practitioner rather than an academic. Also, his comments make sense. “Life is tough. It’s tougher if you’re stupid.” –John Wayne, Western Film Icon. “As to methods, there may be a million and then some, but principles are few. The man who grasps principles can successfully select his own methods. The man, who tries methods, ignoring principles, is sure to have trouble.” – Ralph Waldo Emerson, Essayist and Poet. Or listen to one of our modern philosophers, Public Enemy perform Don’t Believe the Hype! www.youtube.com/watch?v=aCLrPieciJo&feature=related before taking anything you read at face value. With all the quotes I am hoping to instill that the only way YOU will become a great investor is to be unique. Take these principles, case studies and learn to apply them to your own opportunities and situation. “To buy when others are despondently selling and to sell when others are avidly buying requires the greatest fortitude and pays the greatest ultimate rewards.” –Sir John Templeton. OK, all those common sense suggestions for investing are nice to know but how do we implement such an approach. How do we figure out intrinsic value and a margin of safety? Warren Buffett said that if he were teaching an investment class, he would focus on A. Valuing a business and B. How to think about prices. We need to think through distinguishing between valuing assets and valuing a franchise, being cognizant of what we pay for growth in an investment and how do we manage risk of a permanent loss of capital. I will start with a series of investment lectures which will include case studies and then different investment problems will be analyzed in separate readings, links or videos. Finally let me state my biases upfront. I don’t believe one must graduate from business school, have gone to college, and have an MBA, CPA or CFA to be a great investor. In fact, I would wager that if a person wanted to really learn about investing, he or she could take a few introductory accounting courses through a free web program like http://www.khanacademy.org/, read Buffett’s Shareholder Letters http://www.berkshirehathaway.com/letters/letters.html), and subscribe to www.grantspub.com for the hefty price of $950 or so but cheap compared to a $150,000 business school tab. At Grant’s Interest Rate Observer http://www.grantspub.com/ you could download and study all past issues since 1982 while learning how a thoughtful, articulate Graham and Dodd investor approached various market cycles through specific investments. Of course, as an ambitious student you would download the financials from the SEC’s website to look at the various companies Grant’s mentions as well as reading many of the books he suggests. Now I admit the person who applies himself to such a project would not be your typical person, but I am suggesting one way to learn. “Self-education is, I firmly believe, the only kind of education there is.” –Isaac Asimov, Author of over five hundred books. “Many who are self-taught far excel the doctors, masters, and bachelors of the most renowned universities.” – Ludwig Von Mises, Austrian Economist and author of Human Action.